Ransomware are becoming the main threat for today’s data. Companies put in place many countermeasures to prevent ransomware attacks and protect data. A commonly defense is a regular offline back-up of the files. This approach works fine for classic and on-premises files repositories. The whole file system – or a part of it – containing relevant files is regularly backed-up using backup software already existing in the company. However, you cannot use the same process for on-the-cloud files, like files stored on Google Drive. Unlike common company files, files stored on Google Drive are not centralized on servers. Normally every user has his/her local copy of the files, brought to his/her PC by Google Drive sync clients. This situation would require to backup every user PC, which is a complex and hard task. Moreover, the local copy could be partial, which complicates the entire situation. There are also cases or configurations where files are normally persisted only on Google Drive and locally downloaded when required. The Google Drive File Stream client works this way. In such a situation, it is impossible to get a complete user’s local copy. In case of a ransomware attack, local files are encrypted and locked. The files most targeted by ransomwares are those most valuable for a company: documents, images, worksheets, PDFs, etc. Usually, they are the same files placed on Google Drive. During the attack files are encrypted by the ransomware and this triggers the local Google Drive client to perform a synchronization with the cloud. From its perspective, they are locally modified files that must be uploaded to the cloud. Shortly, all files are delivered to the cloud and original files are replaced with the encrypted versions. And this is not the end of the story. If the files are shared with other users – as single files or folders or Team Drives – all the other users receive the encrypted version of the files. 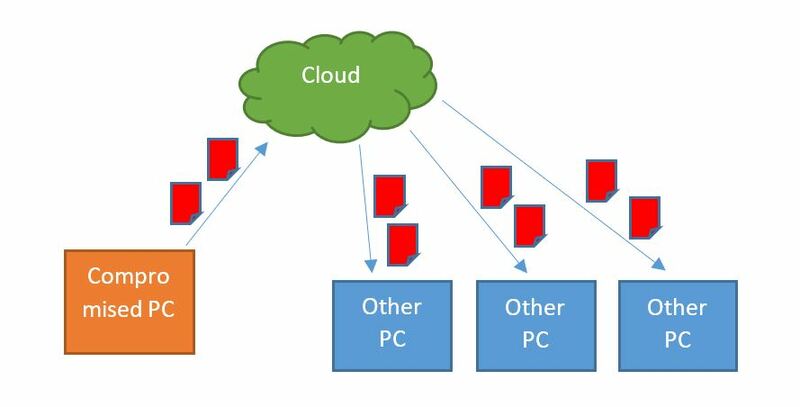 As a result, a single compromised PC can impact many users working on other computers. The root cause is the always-on-line architecture of Google Drive. If the network is available, files are continuously synchronized to and from the cloud. The only solution is to create a secured offline copy. DriveExport comes to help. It creates a local copy of all the files stored on GSuite Google Drive, both personal and Team Drive files. That local copy can be archived and secured using a traditional backup software for local files. Enterprise companies can archive cloud- files using the same standards, processes, and tools already in place for archiving and backing-up traditional files, without the need of new software and standards only for managing cloud-files. DriveExport works as a bridge to bring files stored in the cloud to local storage, also allowing to archive them using backup tools already existing in the company.